Ilé La Wà at Richmix. Utterly humiliated, I promised myself that I would master the General American accent, with its long ‘a’ vowels, alveolar flaps, glottal stops and weak-vowel mergers. And I did. These days, out of habit and depending on who I’m speaking with, I code-switch between the familiar lilt of Singaporean English – Singlish – with its elided phonemes and syllable-timed rhythms, and the round rhoticity of General American. I can erase my creole from my mouth if I choose to. Most of the time, it’s a matter of how I want to be perceived. Ilé La Wà, a taut 45 minutes of theatre and performance poetry, demonstrates that how one is perceived is sometimes all that matters. It’s a searing, soulful and often scathing production that dissects the impossible bureaucratic hurdles faced by immigrants to the U.K., blatant racial profiling, and what to hold on to when all one has left is their own story and little else: no documents, no family, no home. Ilé La Wà means “we are home” in the Yoruba language of Nigeria, and it’s a strongly- and beautifully-worded reclamation of what it means to be – and to belong. Four people are trapped in a purgatorial room at an immigration centre. Some of them are undocumented migrants; others insist they are not – but all of them are certain that, whatever the case, the U.K. is their home, or more of a home than any other place might be, or the only home they have left, given the circumstances. They are waiting to be let go, but there’s nothing there to reassure them but the glare of harsh fluorescent lighting, the ticking of the clock and the occasional, disembodied announcement over the speaker that their “details are being verified”, and that they might be called up soon. But how soon is soon? And what if they’re deported? Ellie is the perfect counterpoint to her fellow detainees as they move up and down a sloped platform on the stage, like Sisyphus rolling his rock up a hill in the ancient Greek myth – a futile task. She embodies the guilt of the “model minority”, the denial of those comfortable in their success. She also masks her difficult childhood and her painful path to breaking the glass ceiling. I find myself nodding when she speaks of how, in high-powered meetings, colleagues must reconcile her perfect, posh accent and voice with her face. I also nod when Ronu tells of how he learned his clipped British accent rapidly from children at school, smudging out any trace of his old one, which slips through to the surface now and then. Is learning an accent a compliment – or an act of complicity? Language is so often a structure of power, and Ilé La Wà relies on language, with its sharp wordplay and evocative imagery, to subvert those power structures and give undocumented migrants a voice, and a lyrical, lush one at that. The stories of these four characters were drawn from real life, and fused with poetry written by Tshaka Campbell, Jemilea Wisdom, Russeni Fisher and Belinda Zhawi. Sometimes the combination works perfectly, at other times the characters feel more like static, convenient conduits for beautiful text. But there is no doubting the powerful language they’ve been given to make these issues heard. Tapiwa says: “I want to own possessions – and permanence.” It’s a use of alliteration that is at once beautiful and painful, a cry to be understood underscored by the language used to communicate it. Ilé La Wà is not the only production to have wrestled with the immigrant identity in recent months. 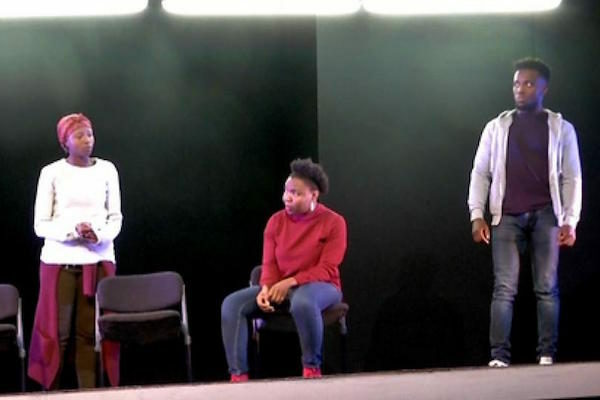 Other examples include the immersive experience London Stories: Made By Migrants at the Battersea Arts Centre and the performance-installation Last Chance by Good Chance Theatre at the Young Vic. It’s a necessary part of the tapestry that’s been growing around immigrant stories and making them an accepted part of theatre and performance in London. The question is how to bring these productions beyond their immediately supportive demographic and to audience members who may not be familiar with, or are even resentful of, the various diasporas in the U.K. But one thing is for certain – the stage is also a home, and I am thankful that theatre can also be a shelter and a safe space for those who need it. To find out more about Ilé La Wà, click here.